I have been having such challenges lately: my computer is about as full as it can stand, I am a pack rat and have such a process to get rid of anything, and am trying to choose the most financially appropriate remedy. One of the things that this means is that I have to be really stingy with downloading photos from camera chips into our photo program until I fix the memory problem. But all that said: here is a low-rez pic of some leaves I sewed for the International Fiber Collaborative. They are making a tree covered with leaves made by people from all over the world. The link that I made for you above will take you to page one of some of the leaves that they have received. Some leaves are fabric, some are made from shopping bags fused together, painted and stitched, others are crocheted, knit, woven from wire ... oh! the list goes on. Lots of inspiration there! 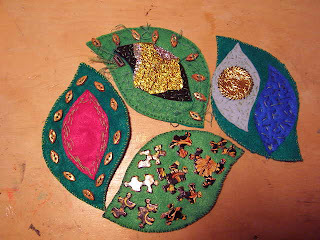 I have sewn tiny polymer beads, candy wrappers, puzzle pieces and smaller felt leaves onto larger felt leaves. I sent them off today with an ATC of needlefelted wool to the artist friend who gave some brightly colored wool roving to our Library ATC group last month. Also in that mail were some ATCs for "my soldier". (I write letters for Soldiers Angels.) ArtMail. Thank God. My studio has been getting a workout lately: I have been planning and prepping for our Art at the Library mini-course in Artist Journals this spring. Of course that means I have to make samples to show everyone! Wanna see? There we go: the page on the left is on drawing paper. 2. Very cheap yellow acrylic paint. 3. 2 different colors of green acrylic smushed and scrunched onto (and off of) the paper with crumpled paper towel. 4. Some vellum envelopes with tiny notes, and pictures, and items of interest. 1. Gesso on drawing paper. 3. Water spritzed then the droplets (and a layer of paint) dabbed off with paper towel leaving curious, unpredictable, roundish yellow marks. 4. Gold, hand-carved rubber stampings. 5. A jewel and two rubber stamp impressed craft foam medallions. 6. I think that there was some water spritzing going on there too. 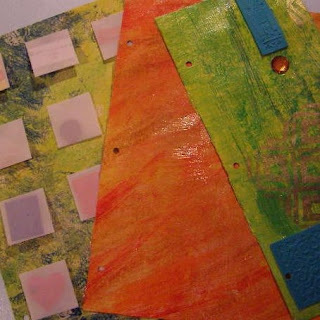 Continuing with the Art at the Library 2009 program, the Rockport Public Library is offering four classes in a mini-course on Artist Journals, beginning on March 21. Artist journals can be created around any theme or just as a place to try new ideas, using many techniques from various media with as much or as little text as the artist so chooses; the class will explore our own definitions of a journal, through visual media, daily record keeping, and written/visual thoughts. The four classes (March 21, April 18, May 16, June 20) will build upon techniques you may have encountered in your explorations with ATCs (Artist Trading Cards). Additional inspiration may be derived from the many journals, diaries, and narratives in the Rockport Public Library's collection. Children younger than 5th grade should be accompanied by an adult partner/buddy. Space is limited to 12 participants. Call the library with questions or to sign up at 236-3642. The Rockport Public Library is located at One Limerock Street in Rockport, and is open Monday, Tuesday, Thursday, Friday, and Saturday 9:00 to 5:30, and Wednesday from 11:00 to 8:00.